I have the issue. My tasks are all set to automatically scheduled. I update actuals weekly and once completed I update the project and select ‘reschedule uncompleted work to start after xxxxx’ . 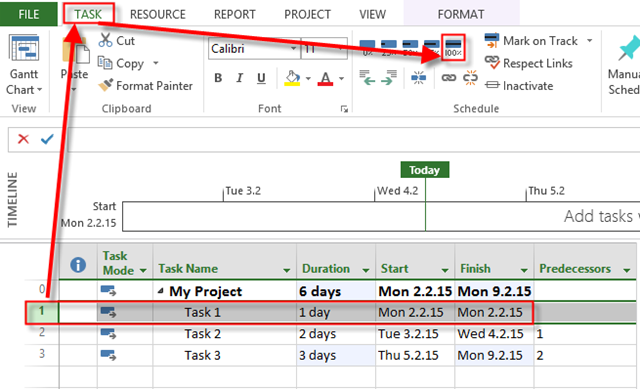 MS project then automatically sets a ‘start no earlier’ constraint with date date(xxxxx) on some of my tasks. I then manually need to remove them the next time i want to update the schedule. Any ideas what is driving this behavior would be appreciated. I will explain this “issue” in MS PROJECT 2013! Now suppose, that today is Friday, 6th, and that I didn’t start with work on Task 2 nor Task 3. So I want to reschedule uncompleted work after this date. WHY? Is this a Bug. No, it’s not. It is logical. Because TODAY is Friday 6th, Task 2 and Task 3 can’t start before that date. So those Task can start at that date and later, but not before, because that will be back to the Past. How can you start to work on soma Tasks in the Past? You can not. So, my suggestion is: Update all your Tasks with actuals, for example, each Friday, and then Reschedule uncompleted work after that Friday and you will get the Real situation in your Project. And yes, some Tasks will have SNET constraint! This entry was posted in MICROSOFT PROJECT, Microsoft PRoject 2010, Microsoft Project 2013, MS PROJECT 2010, PMI and tagged Microsoft Project 2010, Microsoft Project 2013, Microsoft Project 2013 - Scheduling. Bookmark the permalink. Thanks for the discussion. I have a supplementary question. 1. I updated all the project (tasks 2 and 3) to start after Friday 6.2.15. 2. This put task2 at start date 9.2.15 and task3 on 11.2.15. 3. Task2 took very long to complete and it will finish on 20.2.15. 4. There are no dependencies between task2 and task3 which is different then the example above. 6. 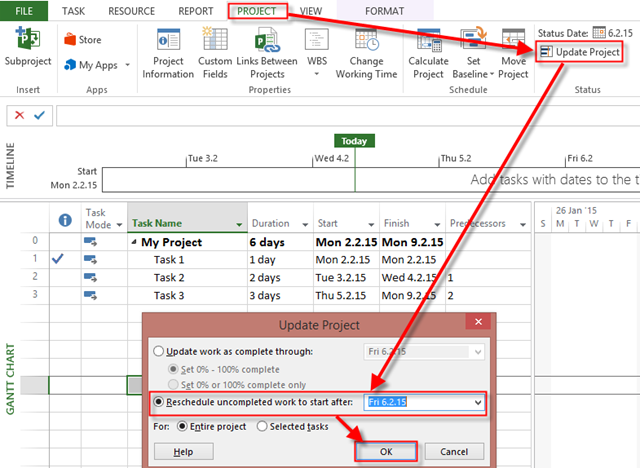 I want to reschedule task3 so I "Reschedule uncompleted work to start after 20.2.15. I'm working on Project 2010 and what happens is that task3 is not changed. I think that it is not changed because in previous time I rescheduled to start after 6.2.15 this set the task to "don't start before 6.2.15" and now becuase it is not "start as soon as possible" the reschedule does not affect it. Now I Level resources and hell breaks loose. Do you know any workaround for this? So if I had a task of 5 days duration and on the 5th and final day I updated that task to 80%, does project not automatically assign the remaining uncompleted 20% to the following day? Is that something you manually have to monitor and change? I’m facing several problems in setting up a master project as well as with entering real work values for resources and levelling. I was wondering though if you can handle such a project for me and what the cost of that might be (of course once you have all relevant details).